RISAT 1 (Radar Imaging Satellite 1) is the first satellite imaging mission of ISRO using an active C-band SAR (Synthetic Aperture Radar) imager. The objective of the RISAT mission is to use the all-weather as well as the day-and-night SAR observation capability in applications such as agriculture, forestry, soil moisture, geology, sea ice, coastal monitoring, object identification, and flood monitoring. RISAT 1 is developed, manufactured and integrated by ISRO. The 3-axis stabilized spacecraft bus consists of a hexagonal prism shape build around a central cylinder. Most of the spacecraft subsystems and the payload are integrated in the prism structure and the central cylinder. The solar panels and some subsystems are mounted on the cube-shaped section of the spacecraft. 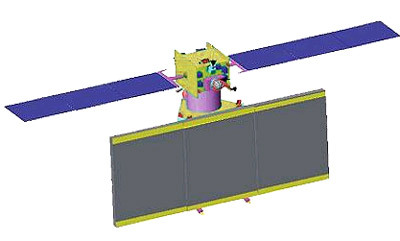 RISAT 1A, a copy of RISAT 1, is planned for December 2018 to provide continuity of service for RISAT-1. RISAT 1B, another copy of RISAT 1, is planned for March 2021.